The way Americans celebrate Christmas present is rooted in Christmases past. Fully 86% of U.S. adults say they intend to gather with family and friends on Christmas this year, and an identical number say they plan to buy gifts for friends and family. Roughly nine-in-ten adults say these activities typically were part of their holiday celebrations when they were growing up. But fewer Americans say they will send Christmas or holiday cards this year than say their families typically did this when they were children. The share of people who plan to go caroling this year also is lower than the share who say they typically did so as children. And while about seven-in-ten Americans say they typically attended Christmas Eve or Christmas Day religious services when they were children, 54% say they plan to attend Christmas services this year. There are significant generational differences in the way Americans plan to celebrate Christmas this year, with younger adults less likely than older adults to incorporate religious elements into their holiday celebrations. Adults under age 30 are far less likely than older Americans to say they see Christmas as more of a religious than a cultural holiday. They are also less likely to attend Christmas religious services and to believe in the virgin birth. This is consistent with other research showing that younger Americans are helping to drive the growth of the religiously unaffiliated population within the U.S. But the new survey also shows that even among Christians, young people are more likely than older adults to view Christmas as more of a cultural than a religious holiday. These are among the key findings of a new Pew Research Center survey conducted Dec. 3-8, 2013, among a representative sample of 2,001 adults nationwide. The survey – which explores Americans’ Christmas plans, childhood traditions, and likes and dislikes about the holiday season – also finds that most Americans say gathering with family and friends is what they most look forward to about Christmas and the holidays. When asked what they like the least about the holidays, many express frustration with the commercialization of the season; one-third say they dislike the materialism of the holidays, one-fifth dislike the expenses associated with the season, and one-tenth dislike holiday shopping and the crowded malls and stores. One-fifth of Americans say they are the parent or guardian of a child in their household who believes in Santa Claus, and 69% of this group says they will pretend that Santa visits their home this Christmas Eve. But Kris Kringle’s visits will not be restricted only to houses where children retain their belief in the “right jolly old elf”; even among adults who say there are no children residing in their household, 21% will pretend that Santa visits their home this year. Among the religiously unaffiliated, 87% say they celebrate Christmas, including 68% who view Christmas as more of a cultural holiday. Roughly eight-in-ten Americans (79%) say they plan to put up a Christmas tree this year. By comparison, 92% say they typically put up a Christmas tree when they were children. 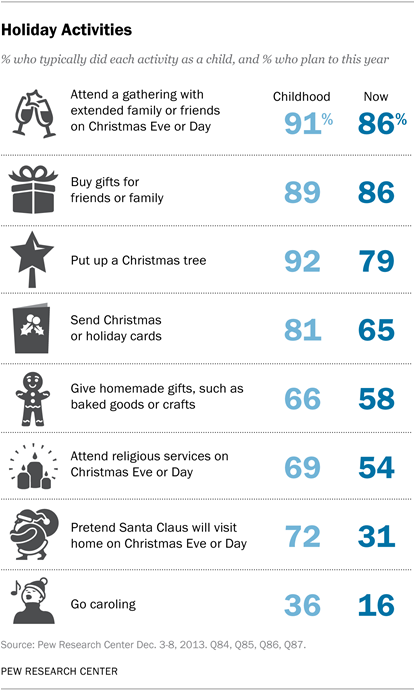 Nearly six-in-ten Americans say they plan to give homemade gifts this holiday season, such as baked goods or crafts. There is a big gender gap on this question; two-thirds of women (65%) plan to give homemade gifts, compared with 51% of men. Those who celebrate Christmas as more of a religious event are much more apt than those who view it as a cultural occasion to say they will attend religious services this Christmas (73% vs. 30%) and to believe in the virgin birth (91% vs. 50%). But on other measures, the differences in the ways the two groups will mark the holidays are much smaller. Roughly nine-in-ten in both groups will gather with family and friends and buy gifts this Christmas, and identical shares of each group will pretend to get a visit from Santa Claus on Christmas Eve (33% each). Half of Americans (51%) say they see Christmas as a religious holiday, while 32% say that, for them, personally, it is more of a cultural holiday. 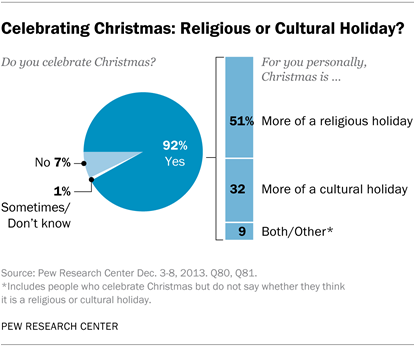 A few (9%) give other responses, such as saying it is both a religious and a cultural holiday or saying it is neither a religious nor a cultural holiday, while 7% say they do not celebrate Christmas, and 1% say they sometimes celebrate Christmas or decline to answer the question. Eight-in-ten white evangelical Protestants (82%) see Christmas as a religious holiday. Smaller majorities of white Catholics (66%), black Protestants (60%) and white mainline Protestants (56%) see Christmas as more of a religious than a cultural holiday, as do about half of Hispanic Catholics (51%).1 Among the religiously unaffiliated, two-thirds celebrate Christmas as more of a cultural than a religious holiday. More women (57%) than men (46%) see Christmas as a religious rather than a cultural event. And there is a striking generational component to views on this question. Fully two-thirds of Americans age 65 and older see Christmas as a religious holiday, as do most Americans ages 50-64 (55%) and half of those in their 30s and 40s (50%). By contrast, 39% of adults under 30 say Christmas is more of a religious holiday, while 44% say for them, personally, Christmas is more of a cultural occasion. Slightly more than half of the public (54%) says they plan to attend religious services on Christmas Eve or Christmas Day this year. By comparison, about one-third of the public (36%) says that they attend religious services in a typical week. Three-quarters (73%) of people who say Christmas is more of a religious holiday plan to attend religious services either on Christmas Eve or Christmas Day. Far fewer people who say they see Christmas as more of a cultural holiday or who do not celebrate Christmas at all say they will be in the pews this Christmas (30% and 24%, respectively). Women are somewhat more likely than men to say they will attend Christmas services this year (58% vs. 50%), and parents who are currently raising minor children in their household say they will attend Christmas services at higher rates than non-parents (59% vs. 51%). A majority of adults age 30 and older say they plan to attend religious services this Christmas, compared with 46% of adults under 30. Among religious groups, three-quarters of Catholics (76%) and seven-in-ten white evangelical Protestants (71%) plan to attend Christmas religious services this year, as do two-thirds of black Protestants (65%). About half of white mainline Protestants say they will attend Christmas services. Among U.S. adults who are unaffiliated with a religion, just 16% say they intend to go to religious services this Christmas. Roughly seven-in-ten Americans say they typically attended Christmas religious services when they were growing up. Younger adults are less likely than older adults to have grown up doing this. Roughly three-quarters of adults age 50 and older say they grew up attending Christmas services, compared with two-thirds of those in their 30s and 40s and 62% of those under age 30. Roughly three-quarters of adults (73%) say they believe Jesus was born of a virgin. About one-in-five (19%) say they do not believe this, and 7% say they don’t know or decline to answer the question. 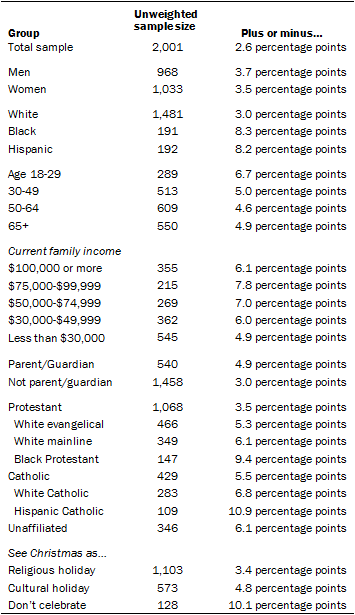 The vast majority of white evangelical Protestants (97%), black Protestants (94%) and white Catholics (88%) believe in the virgin birth of Jesus, as do 81% of Hispanic Catholics. Fewer white mainline Protestants (70%) believe this. Among the religiously unaffiliated, 32% believe that Jesus was born to a virgin. About nine-in-ten adults (91%) who see Christmas as a religious holiday say they believe Jesus was born of a virgin. However, even among those who celebrate Christmas as a cultural holiday and those who do not celebrate Christmas, roughly half say they believe in the virgin birth. Nearly nine-in-ten Americans (86%) say they plan to gather with extended family or friends on Christmas or Christmas Eve this year. This type of gathering is common among all demographic and religious groups in the population. Similar shares of those who celebrate Christmas as a religious holiday and those who see it as more of a cultural holiday say they will gather with family and friends on Christmas (89% and 88%, respectively). And even among those who say they do not personally celebrate Christmas, half (51%) say they nonetheless will get together with family or friends on Christmas or Christmas Eve. Gathering with family and friends on Christmas was also a common experience for most people when they were growing up. Nine-in-ten Americans (91%) say they typically gathered with extended family and friends on Christmas when they were children. Fully 86% of Americans say they plan to buy gifts for friends and family over the Christmas or holiday season this year. This includes large majorities of people in all large U.S. religious groups as well as those without any religious affiliation. Buying gifts is less common among Americans whose annual household income falls below $30,000. Roughly three-quarters of those earning less than $30,000 plan to buy gifts this year, compared with roughly nine-in-ten or more of those in higher income brackets. Nine-in-ten Americans (89%) say buying gifts was also typically part of how they marked the holidays as they were growing up. Roughly six-in-ten Americans say they plan to give homemade items, such as baked goods or crafts, as gifts this holiday season. Far more women than men say they plan to give homemade gifts this year (65% vs. 51%). Making homemade gifts is also more common among whites (62%) and Hispanics (54%) than among blacks (41%), and it is more common among parents of minor children than among those who are not currently raising children in their households (64% vs. 55%). Similar numbers of high-income earners and those with lower household incomes say they plan to give homemade gifts this year (61% among those earning $100,000 or more, 59% among those earning less than $30,000). Two-thirds of Americans say they typically made homemade Christmas and holiday gifts when they were growing up. Nearly six-in-ten Hispanics say they are parenting minor children in their homes, including 38% who have children who believe in Santa Claus. By comparison, fewer blacks and whites say they currently have Santa-believing children (21% and 15%, respectively), in part because blacks and whites are less likely than Hispanics to have minor children in the home. Being the parent or guardian of a child who believes in Santa Claus is most common among Americans ages 30-49. Nearly two-thirds of respondents in this age group (63%) say they are parents, including 38% who have a child who believes in Santa Claus. Compared with those in their 30s and 40s, both younger adults and those 50 and older are less likely to be parenting children and to have children who believe in Santa. Nearly three-quarters of Americans say they typically received Christmas Eve visits from Santa as children. This includes big majorities of those age 65 and older (who were raised in the 1940s, 1950s and earlier) as well as those who grew up several decades later in the 1980s and 1990s. Eight-in-ten Americans (79%) say they plan to put up a Christmas tree this year, and two-thirds (65%) say they intend to send Christmas or holiday cards. Far fewer (16%) say they plan to go caroling this year. Putting up a Christmas tree is a common practice across a variety of demographic and religious groups. Even among those who are not affiliated with any religion, 73% say they plan to have a Christmas tree this year. And a recent Pew Research survey found that 32% of Jews say they had a Christmas tree in their house last year. Erecting a Christmas tree is, however, somewhat more common among high-income earners (86% among those earning $75,000 or more) than among those with lower household incomes (75% among those earning less than $30,000). More whites (81%) and Hispanics (82%) than blacks (65%) say they intend to put up a tree. Fully 90% of parents of minor children say they plan to put up a tree, compared with 73% of those who are not parents or guardians of children in their home. Sending Christmas or holiday cards is more common among adults age 50 and older than among younger adults. Nearly three-quarters of adults age 65 and older (73%) say they intend to send Christmas cards this year, as do 68% of those ages 50-64. By comparison, 59% of adults under age 30 say they plan to send cards this year. Upwards of nine-in-ten U.S. adults say they typically had a Christmas tree in their home when they were growing up, and 81% say they or their family sent out Christmas or holiday cards. Compared with blacks and whites, fewer Hispanics say their family typically had a Christmas tree (79%) or sent holiday cards (56%) when they were children. Roughly one-third of Americans say they usually went caroling when they were children. Adults age 30 and older are more likely to remember caroling as a typical part of their holiday celebrations than adults under 30. 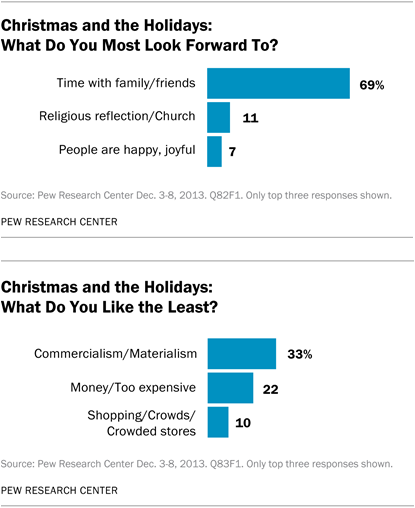 When asked to describe, in their own words, what they most look forward to about Christmas and the holiday season, seven-in-ten Americans (69%), including large majorities across a variety of religious groups, cite spending time with family and friends. Smaller numbers say they look forward to the religious elements of Christmas (11%), to people being happy and joyful (7%), to the Christmas spirit (4%), to Christmas music, decorations and entertainment (4%) and to exchanging gifts (4%). Roughly one-in-twenty Americans (4%) say there is nothing about Christmas or the holidays they look forward to, except perhaps the end of the season. When asked what they like least about Christmas and the holidays, fully one-third of Americans cite the commercialization of the season, while 22% say they dislike the heavy expenses associated with the holidays, and 10% say they dislike holiday shopping and crowds. Smaller numbers lament the de-emphasis of the religious elements of the season (6%), inclement weather (3%), seasonal music and/or garish decorations (3%) and the hectic pace of the holidays (3%). Roughly one-in-five say there is nothing they dislike about the holidays, other than that they often seem to be over too fast (6%). The analysis for this report is based on telephone interviews conducted Dec. 3-8, 2013, among a national sample of 2,001 adults, 18 years of age or older, living in all 50 U.S. states and the District of Columbia (1,000 respondents were interviewed on a landline telephone, and 1,001 were interviewed on a cellphone, including 523 who had no landline telephone). The survey was conducted by interviewers at Princeton Data Source under the direction of Princeton Survey Research Associates International. A combination of landline and cellphone random digit dial samples were used; both samples were provided by Survey Sampling International. Interviews were conducted in English and Spanish. Respondents in the landline sample were selected by randomly asking for the youngest adult male or female who is now at home. Interviews in the cell sample were conducted with the person who answered the phone, if that person was an adult 18 years of age or older. For detailed information about survey methodology, see http://people-press.org/methodology/. The combined landline and cellphone sample are weighted using an iterative technique that matches gender, age, education, race, Hispanic origin and nativity and region to parameters from the 2011 U.S. Census Bureau’s American Community Survey and population density to parameters from the Decennial Census. The sample also is weighted to match current patterns of telephone status and relative usage of landlines and cellphones (for those with both), based on extrapolations from the 2012 National Health Interview Survey. The weighting procedure also accounts for the fact that respondents with both landlines and cellphones have a greater probability of being included in the combined sample and adjusts for household size among respondents with a landline phone. Sampling errors and statistical tests of significance take into account the effect of weighting.